We address these objectives by being in accordance with the Fire Safety Plan and BC Fire Code. Our goal is to minimize the risk to those at St. Bernadette’s by ensuring that in the event of a fire emergency, everyone will be able to safely evacuate the school via the nearest exit. Fire drills also allow us to inspect and test procedures for our fire protection systems. Our fire safety plan identifies potential fire hazards to be prevented in at St. Bernadette’s and it provides an outline of procedures to be followed in the event that an emergency evacuation is ever necessary. I am very pleased with the effort and attention the teachers have provided when it comes to the safety of your child(ren). The fire drill was done with efficiency and great attention to detail. Everyone was evacuated quickly and safely. I am confident that if such an emergency was to occur where we had to evacuate the school immediately, it would be done so in a very effective and safe manner. If you have any questions regarding safety in our school, please contact Mr. van der Pauw through the school office. We are excited to announce that our first movie night for the year will be on Friday September 30th at 7:30pm. It will be held outside, under the stars in the court yard! Bring your lawn chairs, blankets, mittens, etc. as we expect it to be a clear and cool night. The movie will be projected onto a large blow up movie screen! Special thanks to Brent Roberts for donating all the equipment for the evening. There will be a concession stand and pizza available (starting at 7pm). We are also excited to announce that The movie for this community event will be Finding Dory. Admission is $5 per person or $20 per family and includes entry, drink and popcorn with the movie. We ask that all children to be supervised by an Adult. We look forward to seeing you at our first community event of the year. 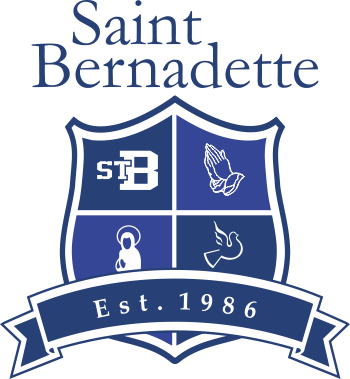 The parish would like to remind all parishioners that you are able to use your St. Bernadette envelopes at other parishes. This is important when re-registering in the spring so that you can stay at your current category. If you have any questions please contact the parish. Individual student photos will be taken on Thursday, September 22nd. Please ensure that your child is in full uniform on this day. Last week your child was given the portrait selection sheet from Lifetouch. Whether you are ordering or not please complete the form and have your child give the form to the photographer on picture day. Samples of the photos will be sent home via the school approximately 2 weeks after photo day. Please ensure that your child(ren) are present at school for these photos as they are the photos that are used for the school database. Please mark your calendars for September 22nd Meet the Teacher/Parent Information Night. The evening begins at 6:30 in the parish hall. The school will be relaying some very important information in regards to the upcoming school year. After the short gathering, parents will then proceed to their child’s class to meet the teacher. Teachers will share information for the year ahead. It is really important that you attend this evening and 1hour of parent participation will be given to every family who attends. This is one of two mandatory nights for families so please make arrangements to attend (the other night is the AGM/Parent Support Night in January). This is just a reminder that as the months get colder, there is a pant option for girls. If you would like to order pants for your child please use the order form provided by Cambridge Uniforms. The PEC is in the works of creating a new system for recording Parent Participation Hours. The new system will be online and is designed to make the process easier for parents. This new system will be unveiled at the Meet the Teacher/Parent Information Night. Please make sure you are there. If your child is going to be late or absent, please call the office before 9:00 am., if calling prior to 8:30am, please leave a voicemail for the school secretary, do not leave a voicemail for the classroom teacher, as the teacher may not have had time to check their voicemail When your child returns to school, please ensure that an Absentee Form is completed with the correct date of the absence, the reason for being absent and a parent’s signature. This form is to be given to the teacher so that we are able to keep an accurate record for the attendance audit. An Absentee form is attached and can also be found at the school office or downloaded off of the school website. If your child is going to be late, please have him/her sign in at the office and get a late slip. • your child needs to leave the school for an appointment, etc. Once school has started, children who are late or who have to leave the school early MUST sign in or out at the office. The Hot Lunch program will start in October. Typically it will be the 2nd Wednesday of every month. Order forms will be sent home towards the end of September. As you have probably of noticed, their are new lines painted in our parking lot. The design it to provide students with more activities during recess and to provide better safety measures during school hours. The solid yellow line running parallel to the school field and playground is not to be crossed by any vehicle from 7am (the start of Stingers Club) to 6pm (the end of Stingers Club). This is to ensure proper safety for our students. A yellow line has also been painted at the drop off area near the exit gates. Please stop your vehicle behind this line to drop of your children safely before school. We notice that quite often we find uniforms in the lost and found without student names on it. It is important to label your uniforms and to relabel them throughout the year if you are using a marker on a tag.